What is a Backup Credit? A Backup Credit is one-month of Backblaze Computer Backup service. Credits have no cash value, and are worth 1 month of backup. Credits are non-transferable. Credits are applied automatically upon your next eligible renewal. Credits are tracked no your Backblaze billing page. To visit your Account Billing page (sign in with your Backblaze credentials and you will be taken to the Billing section). 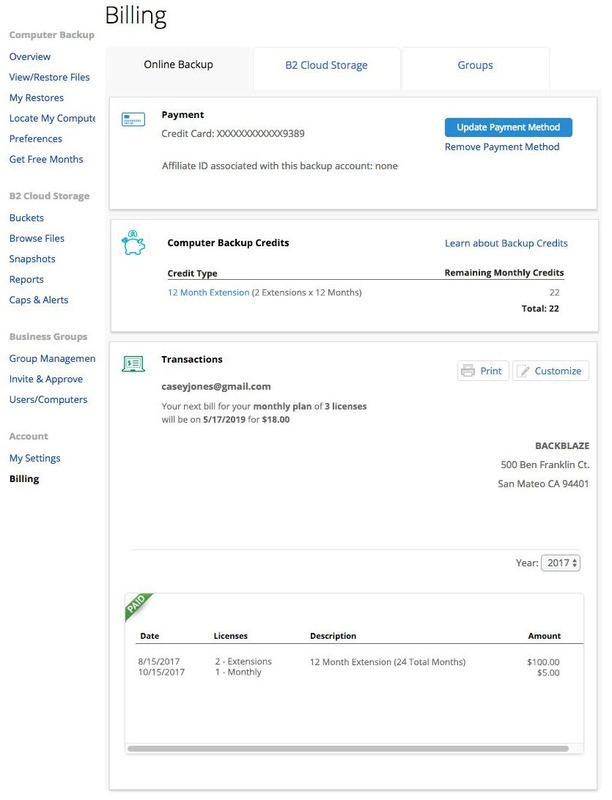 Available Backup Credits will appear underneath the Payment section. If you are a Groups user, please navigate to the Groups tab to see your Group Backup Credit information. What Happens To Backup Credits If an Account is Cancelled? The Backup Month Credits and any associated licenses will be removed upon account cancellation. No recovery is possible after that point. Please visit the Terms of Service for more information.